How do I like my new Losmandy GM811? That’s a question I’ve gotten a lot over the last few weeks. But what is the answer? Given the limited amount of time I’ve had to use the telescope mount, I can at least say I like what little I’ve seen so far. The problem, as you’ve no doubt guessed, has been the weather. Mostly clouds, and if not clouds, heavy haze. There has yet to be an imaging-worthy night since the mount arrived from California, but I have had an opportunity to use it visually a couple of times, so that’s what this will be about. I do hope to use the Losmandy for picture taking at its first star party, the Deep South Star Gaze later this month. I hope so, anyway. Alas, the DSSG comes early this year, in late October, and historically, that’s not a recipe for the best skies (not that I want to jinx things; I'm knocking on wood right now ). Sure, the Losmandy mounts are pretty—all that beautiful machining and anodizing—but that’s not what attracted me to the GM811. What did was its good weight to payload ratio. The Chinese mounts (with the exception of the iOptrons) have a fatal flaw for those of us who don't want to or can't wrestle with heavy GEMs. You get decent payload capacity, but that's at the expense of high mount weight. The Atlas and CGEM, for example, can handle maybe 40 pounds of telescope and gear for imaging, but they weigh in at around 40 pounds (for just the mount head). In contrast, the GM811, which is a Losmandy G11 RA assembly mated to a Losmandy GM8 declination assembly, weighs less than the Syntas at 27 pounds, but has a payload capacity of 50-pounds. 27-pounds is about the limit of what I feel I should be lifting given my current back problems, and it’s really not bad at all. I could reduce it even further if I removed the mount’s big, honking counterweight shaft, and I will probably do that for transport to the star party. For use in the backyard, however, I can manage it with the bar in place. There’s also the question of how easy the GEM head is to attach to the tripod. Lighter weight won’t help if you have to fiddle around getting the mount head settled on the tripod. The Losmandy tripod makes that easy. The head is a cylinder with slots for the Allen attachment screws on the mount head. Line the screws up with the slots, lower it into the tripod, turn to engage the screws, and tighten ‘em down. No threaded rods or stuff like that to mess with. Speaking of tripods, how is the one I chose for the GM811, the Losmandy LW (lightweight) tripod? I love it. It’s plenty sturdy given my modest loads, a C8 and 6-inch class or smaller refractors of moderate focal lengths. The big deal for me? It is strong and sturdy, sure, but it weighs about half what the 2-inch steel legged Chinese tripods, like the one that was furnished with my Celestron VX do. Any problems? As I’ve mentioned previously, there’s no accessory tray. I need to make one before the star party, I guess. For now, I’ve been getting by with a camp table set up next to the telescope to hold the GM811’s HC and power supply. Mount on tripod, let’s attach the scope. The GM811 has a dual saddle that will accommodate either a Vixen (all I have now) or a Losmandy D style dovetail. Install the mount’s declination counterweight on the dec shaft (always do that first), slide the scope’s dovetail into place in the saddle, lock it down and you are ready to balance—which you do just as you would with any other German mount. Is balancing overly critical with the Losmandy? No, but if you are way off balance, you can get motor stalls. One night out with a telescope I am testing, a 5-inch range triplet APO, I wasn’t careful about balancing; I didn’t take into account the heavier weight of the objective end as compared to my personal scope, a doublet APO of similar aperture. I’ll fess up: I didn’t balance at all. I just set the scope up as I would my lighter doublet refractor. With the scope badly off balance (it turned out), I did eventually get a stall, but that’s been the only time despite me doing dozens of gotos all over the sky in the course of my scope-testing. How about the Losmandy’s clutches? Well, they are different from what you may be used to coming from Synta and Meade. The Syntas and their kin don’t really have clutches. They have locks. The Losmandy has real slip clutches. You only need to lock them down tightly enough so the scope is held firmly enough that bumping it or changing eyepieces doesn’t move it. With the power on or off, you can then move the telescope by hand—like to put it in home position—without loosening or otherwise fooling with the clutches. Naturally, moving the scope after goto alignment will cause you to lose said alignment, but I’ve found the clutch paradigm very useful during setup/polar alignment. It’s time to polar align. How sensitive is the GM811’s Gemini 2 goto system to polar alignment errors? I’m not sure, since it’s so easy to do a good polar alignment these days. The mount computer features a built in polar alignment routine, but most people will probably opt for the new ways now: Polemaster or Sharpcap. I’ve chosen Sharpcap since I have a guide scope/guide camera perfect for use with the program’s polar alignment tool. I set up the mount with the polar axis pointed as close to north as possible (using a compass). I don’t take incredible pains to do so, but I try to get close. When Polaris peeps out, I plug my QHY5L II guide cam, which is inserted in an Orion 50mm finder-style guide scope, into the PC, and bring up Sharpcap. In just a few minutes, the program will have me polar aligned very accurately indeed. If Sharpcap makes it easy, the GM811’s altitude and azimuth controls make it easier. They are smooth and precise and quite an advance over the crude (and I do mean crude) alt-azimuth controls on my old EQ-6. The Losmandy goto system, the Gemini 2, seems to have a reputation for being “hard to understand” and “user unfriendly.” That worried me when I was mount shopping, but after using the mount just a few times, I’m scratching my head over this criticism. The Gemini 2 is no more difficult to align and use than the SynScan or AutoStar or NexStar controllers. Maybe easier. Certainly, the large, full color (or just red if you prefer) LCD screen is easier for me to read than the small monochrome displays of those other HCs. The alignment process itself is no more complicated than what you have with NexStar or Autostar. You start out with the GM811 in the home position—counterweight down and tube pointed north. At first, I was obsessive about that, being used to my old EQ6—you had to be careful to home that mount accurately if you wanted a decent alignment. So, I used a carpenter’s level to home the Losmandy. I subsequently found out, however, that just moving the mount RA either by hand or with the hand controller until the counterweight bar was straight down by eye, and moving the mount in declination until the declination setting circle read 90-degrees was good enough. When I am in home position, I turn on the Gemini 2 computer, and after the HC boots, I click (touch) “Cold Start” if I am not beginning from Park. Next, I click “Modeling” and the HC asks me if I want to create a model on the eastern or western half of the sky. If I am going to be doing most of my imaging/observing in the west, I choose that. If east, I’ll pick east. From there, things are much like they are with any other goto hand control. Well, sort of. You can choose as many stars for alignment as you wish rather than being limited to two or three. Being lazy, however, I usually leave it at three stars in the east or west and one additional star on the opposite side of the Meridian. Like any other goto system, you’re best off choosing stars that are well separated and not too low to the horizon. “Model” brings up a screen with a button that says “align.” Press that or your star will not be added to the sky model. When you do, you’ll be presented with a screen that gives various alignment error figures. You don’t have to do anything there other than hit “back,” which takes you back to the star choice screen, where you select the second star. A full-blown Gemini 2 alignment involves two models, one for the eastern and one for the western halves of the sky. Each model can be composed of a bunch of stars. Me? I never do that. Haven’t yet, anyway. I do three stars on my favored half of the sky and one more on the other side. How do I do the one for the other side? On the alignment star choice screen, I just choose the opposite side of the Meridian. If I aligned on three stars in the west, for star four I will push east (and vice versa). That will not build a model for the eastern half of the sky; it will just add an eastern star to my western model, which will make gotos more accurate if I cross the Meridian and wind up in the east half of the sky during the evening’s observing run. So, to sum up, I push “cold start” and then “alignment,” choose my favored side of the Meridian, and center three stars. When I am finished with the these three, I add a fourth star on the opposite side of the Meridian and I am done. If this still sounds confusing, play around with the Gemini 2 “simulator” at http://gemini-2.com (“Gemini 2 Tutorial”). Which is where the HC pictures here came from. I am aligned with only four stars. How good is that alignment? I’ve found it’s good enough that anything on either side of the sky will be in my moderate focal length telescopes when they are equipped with a medium power wide-field eyepiece—say a 12mm. I do find objects in the half of the sky where my three alignment stars reside are closest to the center, but even given my minimalist Gemini 2 alignment, the mount has never missed an object. Even the Moon, which can be difficult for goto systems, is always in the field, even if it’s on the other side of the Meridian from the “big three” alignment stars. How do I get to the objects of my desire following alignment? Once again, it’s not much different from the way you do it with other HCs, and simpler than some. Clicking “goto” on the main screen (the one with the direction buttons) brings up a page that allows me to choose classes of objects: “Catalog Object” (deep sky objects), Solar System, Coordinates, etc. Assuming I want to go to a deep sky object, I’ll press “Catalog Object.” I’ll then be presented with a listing of DSO catalogs. I choose the catalog I want, say “Messier,” and on the screen that appears next I enter the object’s number. Hitting enter gives the target’s stats. Pressing the screen's goto button will then slew the scope to the object. That is all there is to it. There are many options available with the Gemini system: you can save favorite destinations, enter coordinates to go to objects like comets, and upload new catalogs to the HC, but basic operation is, yeah, pretty darned simple. Once you’ve got your feet wet using the mount with the hand control, you may want to give operating it with a laptop a go. I won’t bore you with the details again—I talked about this at some length not long ago—but suffice it to say the mount is no more difficult to interface to a computer than the Celestrons or Meades are. Actually, it can be easier, since you don’t have to mess with a dratted USB-serial adapter. You can connect mount to scope with an Ethernet cable (you can also use serial if you insist). Some people find setting up Ethernet a little difficult, but if you follow simple directions at Gemini-2.com it is pretty easy. If you have trouble, I will be happy to help and can definitely get you going (send me a Facebook message or comment here). 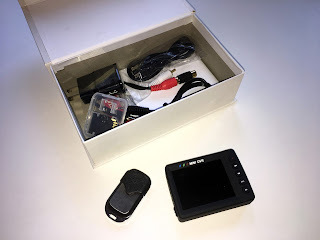 Once the Ethernet interface is active, a laptop can command the mount with the Gemini 2 ASCOM driver using Stellarium, or Cartes Du Ciel, or TheSky or any other ASCOM compatible program. When the Ethernet cable is squared away, you can also operate the mount with a web browser without using any astronomy software at all. Built into the Gemini 2 computer is a little website. You don’t need Internet to connect to it, just that Ethernet cable. Enter the URL, “gemini” into your browser and up will come a page that allows you to goto objects, move the scope, edit mount parameters and do many other things. Pretty slick. That computer stuff is pretty slick, but the takeaway for new users should be that the basic operation of the GM811 (and other Gemini 2 equipped mounts) is little different from the Meades or the Celestrons or the SkyWatchers. “That’s cool, Unk, but how is the mount mechanically?” For me, it’s a dream. Everything is just so much nicer than the inexpensive mounts I’ve used over the last 15 years or so. In addition to the much better alt-az adjusters and the cool friction clutches, the R.A. and declination movements of the GM811 with those clutches undone are free and easy, making it a joy to balance even lighter scopes. How solid is the Losmandy, though? The mount is advertised as having a 50-pound payload capacity, and while I haven’t approached that with my modest instruments, it is remarkably solid and shake free with them. 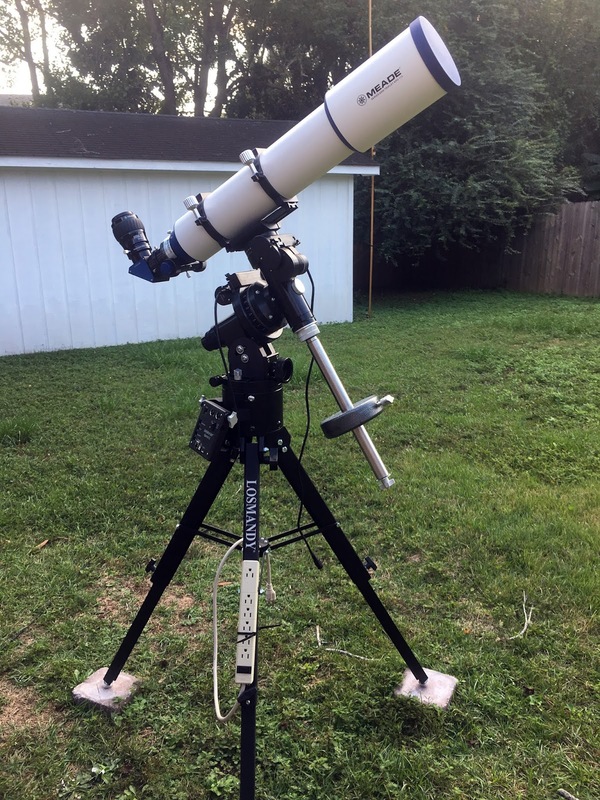 My 6-inch f/8 refractor has a tube long enough to challenge the stability of some mounts—a longer lever arm can cause worse shaking than higher weight—and is very steady with the GM811. To sum up? The GM811 is not a top tier mount price-wise. It is certainly not a Mercedes or a Porsche. Nevertheless, it’s solid and I believe it will be very dependable. It might not be a Mercedes S-Class, but I feel like I’ve at least moved up from Kia and Hyundai to a Toyota Camry or a Honda Accord, and that is more than good enough for me, campers. As you may have gathered from the last installment of this blog, I’ve become somewhat interested in doing astro-video again. I got out my Mallincam and my Revolution cameras, and both were fine. What wasn’t fine was my little Orion DVR. It was obviously on its last legs. Not electronically, but mechanically. The switches and connectors were failing. That was OK. I definitely got my money out of it—I used it heavily for much of the Herschel Project after purchasing it seven years ago. But what was I gonna do now? How would I record my video images? How would I get them into a computer for processing into deathless masterpieces? Up stepped astro-video guru and all around nice guy Mike Fowler of Orange County Telescope. He said he had a new DVR, one similar in size to the old Orion, he thought I might like to check out. I don’t believe in coincidence, but if you want to say this was one, I’ll just call it a happy coincidence. I’ve now got Mike’s Revolution DVR in hand and it is a cute li’l thing. If only the skies were cute. Instead they are hazy and nasty and haven’t allowed me to try the DVR with my beloved Revolution camera yet. Expect report when I am finally able to do so.